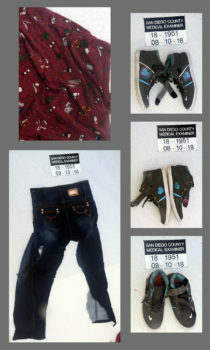 The San Diego County Medical Examiner’s Office is asking the public to help identify a young woman who was struck and killed by a vehicle Aug. 9 while trying to run across the northbound lanes of Interstate 5 just south of the San Clemente Border Patrol Station checkpoint. The woman was struck about 9:30 a.m. by a driver who stopped and called 911. Despite aggressive life-saving measures taken by paramedics and trauma doctors at Scripps Memorial Hospital La Jolla where she was flown, she never regained consciousness. She is believed to be Latina and in her late teens to early 20s, and she had possibly recently traveled into the country from Mexico or another Central American country, said Tessa Lee, a medical examiner’s investigator. “We are hoping that someone may recognize this young woman so we can identify her and notify her family,” said Lee. A fingerprint search on the FBI and U.S. Border Patrol databases and local and state databases had no matches, said Lee. A forensic artist has sketched a portrait of the victim as she would have appeared when alive. She had brown eyes and 6-inch-long black hair, a tan complexion, weighed 111 pounds and was 5 feet 1 inches tall. This is the clothing worn by an unidentified woman who was killed Aug. 9 south of the San Clemente Border Patrol Station checkpoint. Investigators are seeking the public’s help to identify the woman. The woman carried no identification or a purse but she wore some distinctive clothing: a maroon shirt with repeating cartoon prints and the word “travels” on it; jeans with a stitched design on the back pocket and a tag brand that reads “Emociones” and has sizing similar to that used in Mexico. Her gray high-top sneakers had a big turquoise sparkly heart on the sides outlined by pink and turquoise metallic studding between a white stripe and a turquoise stripe. Anyone who believes they know the woman’s identity is asked to please contact the Medical Examiner’s Office Investigations Unit at (858) 694-2905 regarding Case Number 2018-01951.